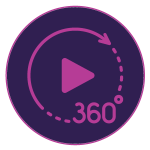 Augment the learning landscape with 360° images and videos and convert them into interactive eLearning material with customizable overlay items such as information blurbs, audio content & quizzes with Adobe Captivate. Make learners explore their surroundings and actively engage with the environment to enhance retention. Achieve complex learning use cases such as compliance protocols in action, virtual walkthroughs, realistic product demos and more. Now you can include 360 slides, right inside standard 2D Adobe Captivate projects. You should review the steps for 360 projects from the Immersive learning with VR experiences page to familiarize yourself with hotspots and interaction. When you blend 2D and 3D in a single project, Captivate will only play the project within a standard 2D browser, full immersive VR is not supported. To add 360 to a 2D project, simply click on the insert slide button from the Toolbar and select the 360 Slide option. Note that you may now mix and match various activities and slide types within a common responsive project. Feel free to import PowerPoint decks, include video demos or software simulations, knowledge checks quizzes and more. The finished project will play within a 2D browser, and the 3D will be navigable by mouse. 360 experience360 images360 videosAdobe CaptivateAdobe Captivate 2019blogvirtual realityVRWhat's new? How does the user select, click, drag? So, after all the hype, its 360 hotspots using 3D glasses. Give a business or workshop example please. Interesting potential for this as well!